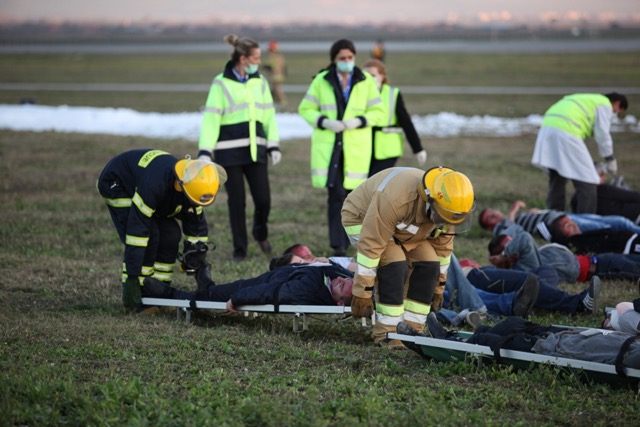 A live emergency exercise to test the ability to deal with a serious incident at the airport involving mass casualties was held today at the Pristina International Airport (PIA). 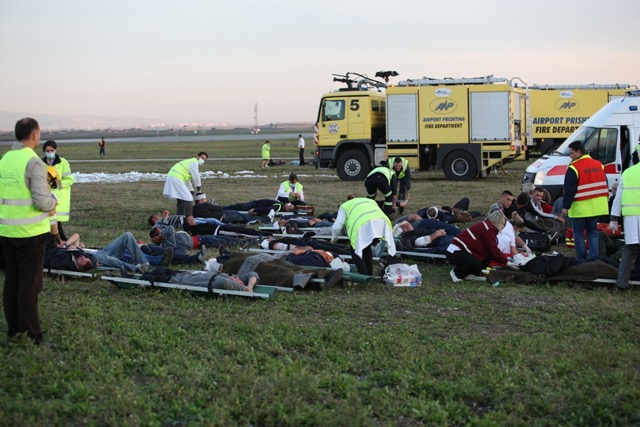 The exercise centred around a scenario of a passenger aircraft which crash lands following brake failure. The exercise tested the drills and procedures of the airport, airport fire service, police, hospital and the Department of Emergency Planning within Kosovo Government together with the functionality of the new PIA’s Emergency Operations Centre. 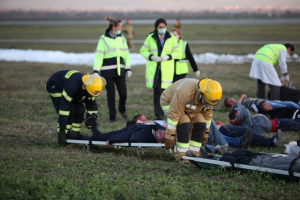 Project experts were involved in the planning working group to ensure everyone played their role in ensuring an effective and efficient response to the Airport Emergency Plan. 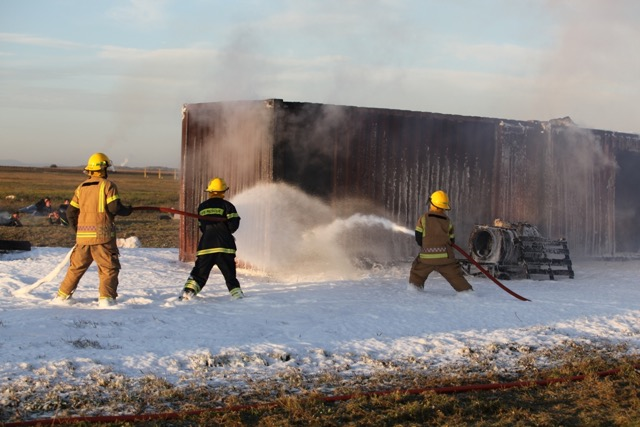 This exercise builds on an earlier project input where experts ran a table-top exercise dealing with a hazardous substance incident at a border crossing point. It emphasized the importance of inter-agency working and giving clear guidance and advice on what Kosovo needs to do to move forward in this area. 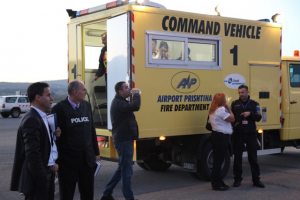 All of this work has better prepared the Kosovo Police to plan and respond to any type of major incident. Emergency and Contingency Planning is critical to major incident response and management, and the importance and dependency of intra and inter-agency co-operation for the successful management of a mass casualty incident needs to be highlighted. The exercise was part of the EU Twinning Project, “Integrated Border Management and the Fight Against Drug Trafficking” which supports Kosovo Border Agencies in strengthening capacity in a number of areas including emergency planning. It is a mandatory requirement of the Kosovo Civil Aviation Authority and for all the stakeholders to participate. It fulfils International Civil Aviation Authority requirements. The twinning project is funded under the IPA 2011 programme with 2 m EUR and will last 30 months (November 2012 – May 2015). It is implemented by Northern Ireland Cooperation Overseas with expertise from the Police Service of Northern Ireland, Her Majesty’s Revenue and Customs, the UK Border Agency, Tulli (National Board of Customs) Finland and the Polish Border Guard. This project’s purpose is to further support the implementation of the IBM Strategy and its Action Plan and the Fight against Drug Trafficking. Good and intensive work has been undertaken so far with the Ministry of Internal Affairs, the Kosovo Police, Kosovo Customs and the Kosovo Food and Veterinary Agency.